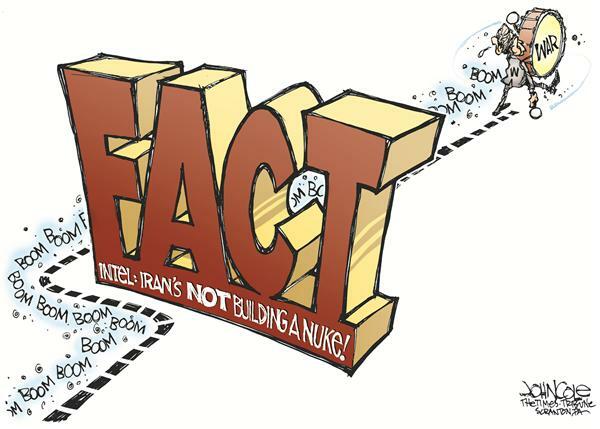 The U.S. Senate Committee on Foreign Relations held a hearing on American policy toward Iran with a lot of information that seems almost humorous when compared with what we factually know. Let’s take a look at some of the points made by Under Secretary for Political Affairs, Wendy Sherman, during her opening comments. A nuclear-armed Iran…would risk an arms race in a region already rife with violence and conflict. One might ask why the region is so unstable and violent? Could it be continued American support for the monarchy in Bahrain that has violently suppressed its people? Or maybe the disastrous invasion of Iraq that has grown into an even more violent country since the U.S. has pulled the military out? And how would we make that region even more violent and rife with conflict? An invasion of Iran would be a start. The fact is American policy in the Middle East has been an obvious contributor to the instability Sherman mentions but there is no acknowledgment of that here. Can’t admit guilt on that one. As a signatory to the Nuclear Non-Proliferation Treaty, Iran has responsibilities to the international community. Or you can just run it over. That works, too! So it’s important for countries in the region to sign on to the NPT and carry out the terms of it? Then why did the U.S. vote against a U.N. resolution calling on Israel to sign the treaty just six months ago? Does this mean Israel does not have the same responsibilities to the international community as Sherman has bestowed on Iran? Difficult to hide this hypocrisy from the anyone in the international community paying even a little attention to this situation. We also have grave concerns about Iran’s destabilizing activities in the Middle East, particularly its support for Bashar Asad in Syria; its support for terrorist organizations like Hizballah; and its unacceptable attacks on innocent civilians worldwide. A lot of the Middle East probably has “grave concerns” about U.S. activities in the region as well but that, of course, doesn’t really matter. As far as the attacks on innocent civilians, one could point out the U.S. is also guilty of attacks on civilians through the drone program but America can’t view these as “unacceptable” attacks because we are the world’s moral authority and anything else is heinous. Israel is not Iran’s only target, however. Iranian national Mansour Arbabsiar pled guilty last year to plotting with members of the Qods Force to murder the Saudi Arabian ambassador by bombing a crowded restaurant here in Washington, DC. Still a lot of questions about this plot and its connection to Iran. The man was deemed to have mental problems, was described by a friend as more “Mr. Bean” than “007”, and the U.S. has never provided any evidence he had a direct connection to the Iranian security apparatus as the government has claimed. Also seems like a smaller act of aggression compared to Israeli assassinations of Iranian scientists and the cyber attack on Iran by the West known as Stuxnet, an action the U.S. would consider an act of war if conducted against it but apparently not an act of war if it commits the attack. (Regarding) Iran’s continued efforts to expand its nefarious interference in the region…It is no surprise then that, according to a 2013 Zogby survey of 20 Arab and Muslim-majority countries, Iran is now viewed unfavorably in a majority of Arab countries and its appeal to mainstream Arab public opinion has virtually collapsed from its 2006 peak. So if a country is unpopular in the region according to the people that live there, that country should stop trying to “expand its nefarious” influence in the region? What is the U.S. approval in some of the countries in the Middle East again? Pretty much as bad (worse in some cases) as Iran. Does this mean by Sherman’s rationale that we will be leaving the region alone, too? Guessing not. Instead of meeting the needs of its own people, the Iranian regime has chosen to spend enormous amounts of its money and resources to support the Asad regime as well as its militant proxies around the world, and to pursue the development of weapons of mass destruction. The sad thing here is, if you change Iranian to American and Assad to (insert name of favorite Middle Eastern dictator the U.S. at some point supported here), you can say the same exact thing about the United States. All of these questionable points coupled with two other facts mentioned during the hearing. The first being there is no evidence Iran is pursuing nuclear materials for weapons purposes, conceded many times throughout the hearing. The second is the West has offered little in the way of sanctions relief in exchange for Iranian actions, another point conceded by Sherman during the most interesting exchange of the question time with Senator Tim Kaine (begins at the one hour ten minute mark in the video and worth watching). This was also addressed yesterday by the CSM in an interview with Iran’s chief nuclear negotiator and potential next president. With all this in mind, it’s time to ask when the U.S. is actually going to get serious about its relationship with Iran. Clearly, that time has not come with such a laughable position on the situation. Posted on May 17, 2013 by Paul PhillipsPosted in Media, Politics, UncategorizedTagged foreign policy, foreign relations hearing on iran, Iran, iran nuclear crisis, iran sanctions, senate committee on foreign relations, u.s. foreign policy.